This is one of those “rush in the door and make something quick” recipes that came about due to speed and necessity to make something quick and tasty with what’s to hand in my fridge. I wasn’t intending to even make this recipe for spiced meatballs. I had something else in mind that I thought would be perfect to put my new Circulon pan to work and it involved eggs but I’ll save that one up for another time. So Circulon got in touch to see if I wanted to road test their 24cm skillet pan from the new “Ultimum” range, RRP £50 (currently on offer at £40). Now as we all know, food bloggers get numerous offers on a daily basis to try out both food products and gadgets. It’s part of our daily ritual to check emails to see what’s new in the food world. But since I have become busier with my workload, I have found myself turning down most offers unless they have genuine relevance to me and my work. Why I accepted this offer from Circulon all stems from way back when, and my very first good quality pan purchase. When I first started my chef training, in my early twenties in the 90s, I decided I needed one really good quality multi purpose pan that could see me through a number of meals. At the time, I was cooking stir fries, curries, pasta dishes and all manner of eggs. I remember being influenced hugely by Ken Hom who always said how important it is in a cook’s kitchen to have a good quality wok. So, I got myself a Circulon wok, which cost me a small fortune. But, along with my Peugeot wooden pepper mill both of these costly purchases still play an important part in my daily cooking routine and are as good as they were twenty years ago. Investing money in your cookware definitely pays off if you are a keen cook. “The Ultimum High Density Forged Aluminium range features a forged edge-to-edge induction base meaning it is suitable for all hob types, whilst the reinforced base and rim guarantee perfect, fast, even heating and no warping. Featuring the easy clean patented flat surface rivet design, the range is metal utensil safe ensuring permanent non-stick durability and comes with either high heat phenolic or durable cast stainless steel fittings”. “The Ultimum Stainless Steel range comes with all the durability of stainless steel with the convenience of Circulon’s Ultra Total non-stick system. Featuring riveted stainless steel fittings for greater strength and durability the range is also metal utensil safe. The stainless steel cookware and handles are ideal for hob top cooking as well as withstanding the oven at high temperatures and come with proven dishwasher safe technology”. Forged pan body – Allows for excellent heat conduction, second only to copper. Having tried the pan on several occasions now, for frying onions, sautéing vegetables, gently scrambling eggs and making speedy sauces I can guarantee you this is now going to be my go-to pan of choice. It is solid without being too heavy, it cooks evenly, colours the ingredients gently and washes like a dream. And when you are cooking spiced meatballs as I have done in this particular recipe, the pan simmers away gently (with an added lid) to seal in the flavours. 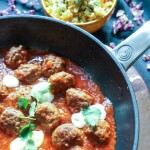 This recipe relies upon ingredients you are likely to have in your food cupboards with the only other additions being your choice of meatball, a clove or two of garlic and the yoghurt coriander garnish which definitely bring the flavours in this dish to life. Disclosure: I was commissioned by Circulon to create a recipe and review their new “Ultimum” skillet pan. A speedy take on a Moroccan stew. 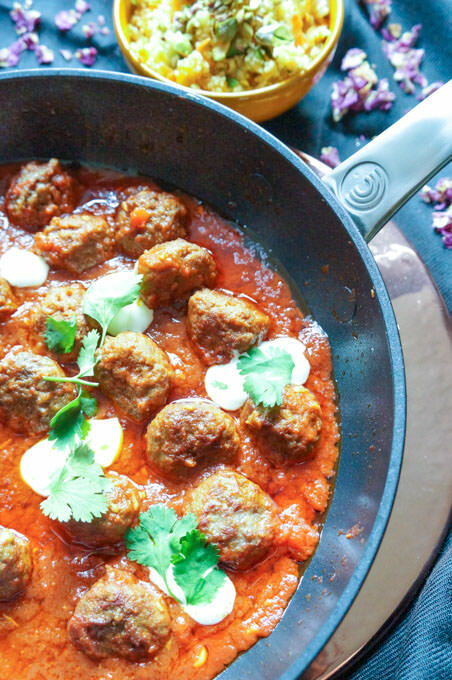 Spiced meatballs with all the flavours of the Middle East. This recipe works well as a speedy supper. It has lots of aromatic flavours yet is ready in under 30 minutes. Oh these meatballs sound heavenly. I love my circulon pans, good pans are so important. This looks great! I love the thought of the turmeric and paprika in that sauce…. yum. The pan looks fantastic as well. That looks so wonderful, I think I could eat meatballs most nights quite happily at this time of year. My mum swears by her circulon pans. Can’t knock a proper non-stick pan. The meatballs look lush! I’ve just got my own Circulon pan and, as you say, get offers that are turned down because they are that relevant. But everyone – novice cook, budding chef, busy mum, chef – needs good pans. This brand is really fab and with a solid reputation. I don’t think my own recipe will be quite up to your standard, but I will know it will be made easy made with this pan. The spicing sounds sooo good. What a great recipe Laura, just the kind of food I love to make a the weekends for the family. I would have to substitute with veggie meatballs, but I think it would work fine. What a fine looking pan too! 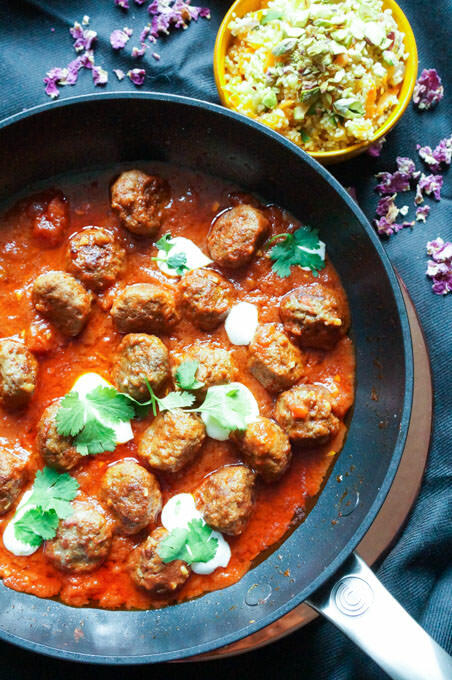 These are so much the kind of food I LOVE to eat, meatballs in a beautiful Moroccan spiced sauce. Look so so good!